The IPCC has claimed in IPCC AR-4, Chapter 9, Executive Summary, that “Greenhouse gas forcing has very likely caused most of the observed global warming over the last 50 years.” This appears to be incorrect because R2 including the influence of CO2 is not significantly different from R2 assuming CO2 has no influence. All those organizations that agree with the Climate Science Community ‘Consensus’ had accepted what the Consensus claimed because they assumed that these Climate Scientists were the experts and had figured it out. In fact, the Consensus had not ‘figured it out’. They did not identify a cause and instead assumed that it must be atmospheric CO2 because they couldn’t think of anything else. This was reinforced by the observation that CO2 and average global temperature increased together from 1973 to 2005 (or at least for the 22 years from 1976 to 1998). However, while CO2 has continued to rise, the temperature has stopped rising. From 2001 through September, 2011 the atmospheric CO2 increased by 23.6% of the total increase from 1800 to 2001 while the average global temperature has not increased. The 23.6% CO2 increase is the significant measurement, not the comparatively brief time period. The temperature range of the 20th century spans about 0.74 C. Of this, about 40% or 0.3 C has excellent correlation with the sunspot time-integral. An equation has been derived that calculates average global temperature based on the physical phenomena involved. 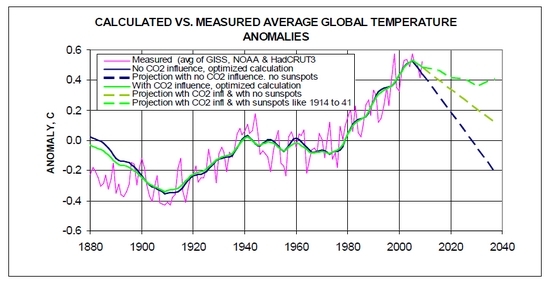 With inputs of accepted measurements (source web links are given) from government agencies, it calculates the average global temperatures (agt) since 1895 with 88.4% accuracy (87.9% if CO2 is assumed to have no influence). This research is presented at Reference 1 and links given there. Clouds radiate energy from the planet. Cloud elevation determines cloud temperature and thus the energy rate. The analysis presented here determines that an increase in average cloud altitude of only about 72 meters results in an increase of steady-state average global temperature of 0.3 Celsius degrees. Svensmark2 has shown that more sunspots correlate with fewer low-level (below 3 km) clouds. 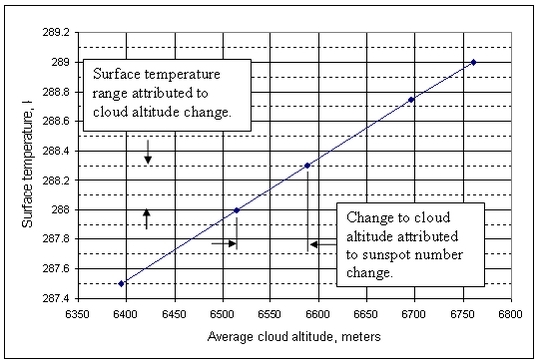 If there are fewer low-level clouds then average cloud altitude must be higher, average cloud temperature lower, less energy radiated from the planet and thus the planet warms. Examination of measured data and data that has been determined using a measured proxy (the time-integral of sunspot number) reveals that climate change, as described by average global temperature (agt), whether it is called Global Warming, Global Climate Disruption or even Global Cooling, has been caused, at least primarily and probably nearly entirely, by natural phenomena. A fairly simple equation that uses measurements of these phenomena accurately (R2= 0.88) calculates agt over the entire period of when it has been accurately measured (since about 1895). The equation and a graph of the latest results are given below. The equation posits that agt variation depends on three things. They are (1) the time-integral of sunspot number (this is a proxy that correlates with energy retained by the planet), (2) the effective sea surface temperature, and (3) the change in the level of carbon dioxide in the atmosphere. The equation contains coefficients that set the fraction of the total change that each of these three contributes. The coefficients are adjusted to find the best match of calculated agt to measured agt. The closeness of match is determined by the coefficient of determination, R2. The coefficients that result in the highest possible R2 allow determination of the fraction that each of the three phenomena contributes. The analysis at Reference 1 presents a method and equation that accurately calculates average global temperatures since 1895 without considering any influence from change to the level of carbon dioxide or any other greenhouse gas in the atmosphere. The coefficient of determination, R2, (R2 is discussed in Ref 2) for that calculation is 0.8686 which means that the equation explains 86.86% of the measured average global temperature (agt) anomalies. This is better than has been achieved by any Global Climate Model. The agt anomaly identified in Ref 1 as a prediction is more correctly called a calculation up to the present and a projection (for the condition of no sunspots) thereafter. The Ref 2 paper includes a determination of the possible influence that added atmospheric CO2 might have on average global temperature. It is a refinement of the previous work which was presented in Ref 1. The Ref 2 work showed that, although assuming no effect of added atmospheric CO2 produced an excellent correlation with measured agt, when a significant contribution from added atmospheric CO2 is included an excellent correlation is also produced, in fact, a tiny bit better. The analysis at Reference 1 presents a method and equation that accurately calculates average global temperatures since 1895 without considering any influence from change to the level of carbon dioxide or any other greenhouse gas in the atmosphere. The coefficient of determination, R2, for that calculation is 0.8686 (all of those digits are as calculated and are shown only to reveal the tiny differences between calculated values. There is no presumption that real-world precision is this close) which means that the equation explains 86.86% of the measured average global temperature (agt) anomalies. This is far better than has been achieved by any Global Climate Model. The agt anomaly identified in Ref 1 as a prediction is more correctly called a calculation up to the present and a projection (for the condition of no sunspots) thereafter. included, an excellent correlation was also produced, in fact, a tiny bit better. This work shows the influence that sunspots have had on 20th century and more recent average global temperatures. Without the influence of sunspots, the trends of anomalies would have been close to the shape of the graph for ESST only. The precise points to make calculations of the effective influence of the sunspot timeintegral are somewhat uncertain. Temperatures predicted at the end points of the ESST trends result in the following: Sunspots had little effect prior to about 1941. The anomaly predicted for 1941 was 0.1017 and in 1973 was -0.0908 for a decline of 0.1925. Without the sunspot time-integral the decline would have been that of the ESST or 0.45.
that the decline from 1941 to 1973 was (0.45 – 0.1925)/0.45 or 57% less than it would have been without the time-integral of sunspot-number during that period. 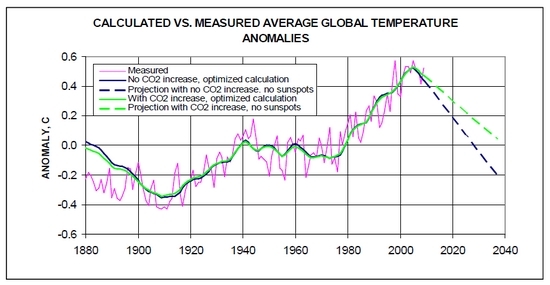 Twentieth Century Temperature Correlation with no CO2 influence (update) by Dan Pangburn, P.E. The attached work should interest you. It shows a rather simple procedure to accurately (standard deviation of differences between calculated and measured temperature anomalies = 0.0634 C) calculate the average global temperature history of the entire 20th century and to the present time using only the time-integral of sunspot count and an assumption of Pacific Decadal Oscillation (PDO) up trend or down trend duration of 32 years and a PDO temperature range of 0.45 C degrees. It assumes no influence from atmospheric carbon dioxide and corroborates previous work. The following description of sunspots was selectively extracted from Wikipedia: “A sunspot is a region on the Sun's surface (photosphere) that is marked by intense magnetic activity, which inhibits convection, forming areas of reduced surface temperature. They can be visible from Earth without the aid of a telescope.